Mio Spirit 697 LM car sat nav has a 5-inch large display and features maps of Europe, which are free to update for the life of the product. Using predictive search you can locate your destination and this Mio suggests fastest, shortest and most economical. The Mio Spirit 697 LM includes 3D junction view as well as major road signs of each road junction. In addition this Mio provides real-time traffic information so you are routed around traffic congestion in the road ahead. You can use the Mio 697 to find nearest the car park and restaurants in the area. Furthermore the Mio 697 will learn your driving style and predict your route based on personalised routes. 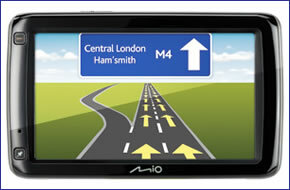 The Mio Spirit 697 LM is the mid-range in car sat nav from Mio. It has a 5-inch large display and comes with maps of Europe preloaded to the device. Buy from ActiveGPS and not only do you get the chance to updates the maps within the first 30 days of registration, like other Mio models, the Spirit 697 includes FREE lifetime maps updates. Searching for your destination is easy using the predictive search facility. You can even use Trip Planner and Mio More Desktop or search on the device to plan your route. You can set multiple waypoints along your journey. Mio Spirit 697LM then provides a choice of routes including fastest, shortest, easiest and most economical. The Mio Spirit 697 LM features realistic 3D junction views and displays major road signs at each junction. Plus IQ routes provides real-time traffic information to help you avoid traffic congestion in the road ahead. The Mio 697 is designed to be used by voice meaning you can enter addresses using your voice. Furthermore, the Mio 697 allows hands-free calls with Bluetooth capability. Plus it automatically changes from navigation to telephone mode when a call is received. This Mio Spirit also includes an AV-in port. This can be used to connect for example a DVD player or a reversing camera to the satnav. Making this a very versatile sat nav. The Mio Spirit 697 also supports MioMore Services. This enables you to get weather information to the device. You can also get Google Local Search so you can find what you are looking for in the local area. The Mio 697 will also learn your driving style and will predict your preferences regarding your personalised routes. The Mio 697 LM can also be used on foot. Designed to be handheld whilst walking about towns and villages you will never lose your way again. Ideal when using the Near Me feature or when finding you car in a car park. Mio Spirit 697 LM has been designed to be Plug and Play, and as such can be transferred from vehicle to vehicle with ease by the user. The Mio Spirit 697 LM is powered with a 12-volt adaptor cable in-car (supplied) and attaches to your vehicles windscreen via the Mio Spirit 697 LM windscreen mounting bracket which is also included. Mio Spirit 697 LM is complete with Europe Plus (44 countries): Andorra, Austria, Belgium, Denmark, Finland, France, Germany, Gibraltar, Italy, Ireland, Lichtenstein, Luxembourg, Malta, Monaco, Norway, the Netherlands, Portugal, San Marino, Spain, Sweden, Switzerland, Vatican City, United Kingdom; Bulgaria, Croatia, Czech Republic, Estonia, Greece, Hungary, Latvia, Lithuania, Poland, Slovakia, Slovenia, Turkey and MRE (Major Roads of Europe): Albania, Belarus, Bosnia-Herzegovina, Macedonia, Moldova, Montenegro, Romania, Serbia and Ukraine.